A woman searches in her bag while her thoughts are somewhere far away. 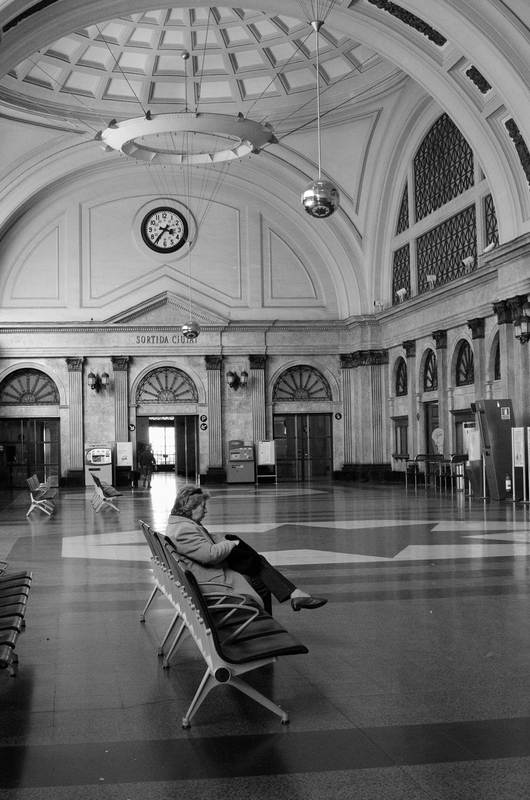 The quietude at the train station hall is the perfect environment to meditate before that long ride to who knows where. The pendulums hanging from the ceiling contribute to the idea of time passing by while the ticking of the clock on the distant wall, almost audible, is only interrupted by the steps of the guard walking his beat. Such is the impressive atmosphere at this famous train station in Barcelona. Find out more about this place in my previous post: Estació de França and Dome Detail. Such quietude at a railway station seem incongruous. It must be Sunday morning in wintertime. This is a great post. The words you wrote to go with the photo make it very impressive. I can hear the clock ticking. -I agree, it was weird that there was this silence, and this quietude. Anyway this is the entrance. Noise comes up when you walk past the ticket office and get near the platforms. -Thanks Lydia, I do like the light. Yep, that's why I chose BW. -Hello Abe, thanks for coming. I thought it was better this way rather than getting too historical and technical. How often are we never "where we are," constantly seeking the next destination, and therefore oblivious of what is happening in the very moment we find ourselves in. Most of my favorite photos of yours have in some way or another touched on this human condition. Since I was hacked I had to give up my old user name and the blogs that went with it. C'est très rare de trouver de la tranquillité dans une gare. Ces instants alternent avec des moments de foule. Tu as bien et décrit ce moment privé pendant lequel, cette femme en toute quiétude s'occupe de ses petites affaires. I really love this photo. You have it explained so well, too. Very romantic, evokes the train stations of old!